"My understanding of women only goes as far as the pleasure. When it comes to the pain, I'm like every other bloke. I don't want to know." 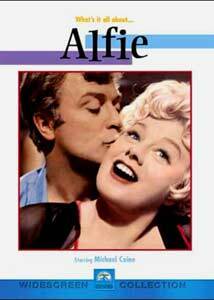 Alfie stars Michael Caine as the self-centered, sexist, "love 'em and leave 'em" Alfie Elkins, who spreads his affections around London with little regard for caution or consequence. After casually "having it off" with a number of women, he impregnates Lily (Vivien Merchant), a married woman, forcing her to have an illegal abortion, and leading Alfie to reevaluate his own life. Lewis Gilbert's 1966 film was Recommended for Mature Audiences at the time of its release, and it deals with a number of adult subjects tastefully and humorously, but without pulling its punches. Alfie pursues women with single-minded determination, using his charm to get what he wants, revealing his true feelings only through casually hurtful words and jokes. He leaves his "bird on the side" Gilda (Julia Foster) with a young son, then loses his "weekend daddy" privileges to Humphrey (Graham Stark), a good-hearted busman willing to marry Gilda and raise the boy as his own. He seduces another man's new girl (Jane Asher) just because he can, starting a huge bar brawl from which he escapes more-or-less unscathed. Simultaneously, he is also carrying on with Ruby, a wealthy older woman (Shelley Winters). Alfie arranges Lily's "examination" at the hands of a seedy abortionist (Denholm Elliott), seeing it as a necessary inconvenience, nothing more. This sequence remains shocking and emotionally intense today—Alfie's accidental encounter with the result of the procedure, unseen but graphically described later on, is charged with pain and a crushing sense of mortality. The supporting cast does a fine job here—each of Alfie's women is an individual, with her own reason for loving him as long as the affair lasts. Some are honest women led astray, some are as shallow as Alfie himself, and some are stronger than he is in the final analysis. But this is Michael Caine's show all the way—Bill Naughton's script (adapted from his stage play) allows Alfie to speak directly to the audience, expounding his tomcat philosophies at length to bawdy comic effect. Caine's performance is remarkable for its sheer charisma, in the face of a story that militates against any empathy for his character whatsoever. Alfie strikes us consistently as the Compleat Bounder, an irredeemable if entertaining heel whose behavior deserves neither respect nor understanding, but he still earns our sympathy in the final minutes of the film. Perhaps it's because, fundamentally, he's an honest person, though not guided by any moral compass beyond a vague sense of male entitlement; perhaps it's because he seems genuinely surprised that he has hurt people by his actions, and tries to make amends after it's too late to do so. In a way, Alfie is a tragi-comic counterpart to Dickens' A Christmas Carol; the ghosts of Alfie's future hold out no hope for redemption, only infinite regret for what might have been. And it is this dark irony that resonates with us after the laughs have passed and the credits roll, transforming the ribald story of one foolish man-boy into a moral lesson for us all. Alfie is an "adult" film in the truest sense of the word, and enormously affecting. Image Transfer Review: Alfie is presented in its original 2.35:1 widescreen theatrical aspect ratio, with a solid anamorphic transfer. The source print has some flecking and a few larger nicks around the reel changes, and a few dark scenes suffer from murkiness and moderate artifacting. For the most part, however, the DVD image looks just great, with bright color and stunning detail, revealing skin, cloth and wallpaper textures with a rich naturalism. Credit Paramount with another fine presentation of a classic film, the way it ought to be seen. Audio Transfer Review: Paramount presents Alfie in its original monophonic audio format, nicely restored in Dolby Digital 2.0, as well as a 5.1 remix in keeping with current DVD marketing requirements. Both tracks actually sound very similar, with a bit of echo and muddiness in many dialogue scenes, though the film's jazz score by Sonny Rollins comes through loud and clear, with competent frequency range and surprisingly strong bass. It appears that the original audio "stems" were unavailable for the 5.1 track, but the electronically-engineered remix spreads the music out across the front soundstage, and the rear surrounds are called into service on a few occasions for atmospheric sound effects. Neither soundtrack is reference quality, but the mono track sounds clear enough, free of hiss and crackle, and the 5.1 remix is respectful of its 1966 source. Extras Review: "What's it all about, Alfie?" Cher's hit musical question goes unanswered here—the disc is limited to standard features including optional English subtitles, 18 picture-menu chapter stops, and the film's blurb-driven theatrical trailer, presented in 2.35:1 anamorphic format from a slightly damaged print. Alfie is a solid, affecting comedy/drama starring the inimitable Michael Caine as a selfish womanizer. Paramount's DVD features an excellent anamorphic widescreen transfer, and the disc is well worth a rental.